A nice spicy main dish shrimp dish, with a touch of citrus. 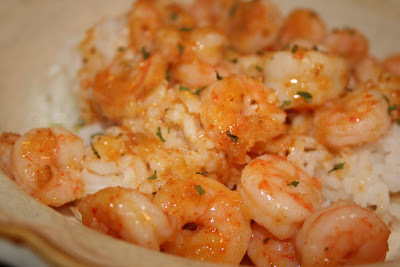 A nice spicy main dish shrimp dish with a bit of citrus and made in the skillet. Quick, light and just delish! Peel and devein the shrimp; rinse and pat dry; set aside. Combine the orange juice with the zest, Cajun seasoning, chili powder, Old Bay, and fresh ginger; add garlic and set aside. Heat the olive oil over medium heat in a large skillet. Toss in the shrimp and stir fry, just until slightly undercooked; remove the shrimp and set aside. Add the orange mixture and bring to a boil until slightly reduced. Stir in the butter until fully incorporated and then return the shrimp to the skillet, tossing to coat evenly. Stir until shrimp is thoroughly cooked and warmed through - but don't overcook! Stir in a couple shakes of dried parsley. Serve over hot rice and garnish with a bit of parsley flakes. Cook's Notes: I sometimes use a spicy chipotle chili powder. Mary, this looks great. I'm trying to find where to use the garlic in the preparation. Have I overlooked it? I'd like to make this dish as a Birthday Dinner, but don't want to mess up. Thanks. Gracious - well, first happy birthday to you or the birthday person! And, yes, I guess that part is missing isn't it? I swear sometimes I think the blog eats parts of the recipes I swear. Anyway, the garlic is added to the orange mixture and goes in the skillet the same time that mixture does.